How to collect trace logs and crash dumps from VDI Agent appliance? 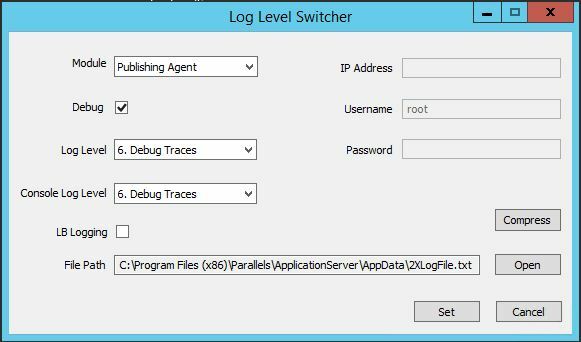 LogLevelSwitcher Tool will help you to collect detailed logs at the moment of the issue replication. This article describes how to use LogLevelSwitcher tool. NOTE: We do NOT recommend to keep detailed logging enabled all the time as it may affect overall performance. Logs may be archived to a specific location in .zip format by using Compress button. Download and Save LogLevelSwitcher before you start. NOTE: Please note that logs for Publishing Agent are collected along with Redundancy Service logs. Run LogLevelSwitcher tool on the machine where the Publishing Agent is installed. Choose a Publishing Agent module. Tick the Debug check box. Set Log Level and Console Log Level to 6 (Debug Traces). Press Apply button in Remote Application Server Console. 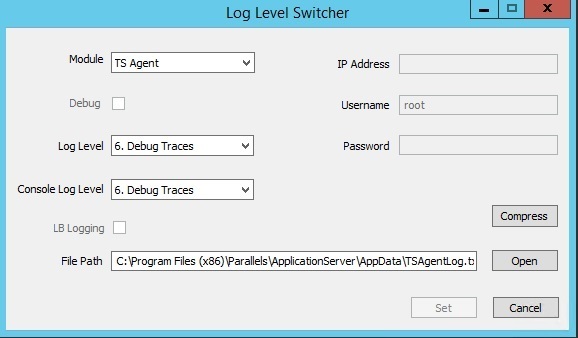 Collect Logs and run LogLevelSwitcher again. Uncheck Debug check box and set Log Level and Console Log Level to 0. Run LogLevelSwitcher tool on the machine where the Redundancy Service is installed. Run LogLevelSwitcher tool on the machine where the TS Agent is installed. Restart RAS Terminal Server Agent service. Set Log Level and Console Log Level to 0. Run LogLevelSwitcher tool on the machine where the Gateway Agent is installed. Run LogLevelSwitcher tool on the machine where the VDI Agent is installed. Restart RAS VDI Agent service. Run LogLevelSwitcher tool on the machine where the Guest Agent is installed. Restart RAS Guest Agent service. Restart RAS PC Agent service.